Recently, various metallocenes were synthesized and analyzed by biological activity point of view (such as antiproliferative properties): ruthenocenes, cobaltoceniums, titanocenes, zirconocenes, vanadocenes, niobocenes, molibdocenes etc. Two main disadvantages of metallocenes are the poor hydrosolubility and the hydrolytic instability. These problems could be resolved in two ways: synthetically modifying the structure or finding new formulations with enhanced properties. The aqueous solubility of metallocenes with cytostatic activities could be enhanced by molecular encapsulation in cyclodextrins, as well as the hydrolytic instability of these compounds could be reduced. This study presents a theoretical approach on the nanoencapsulation of a series of titanocenes with cytotoxic activity in α-, β-, and γ-cyclodextrin. 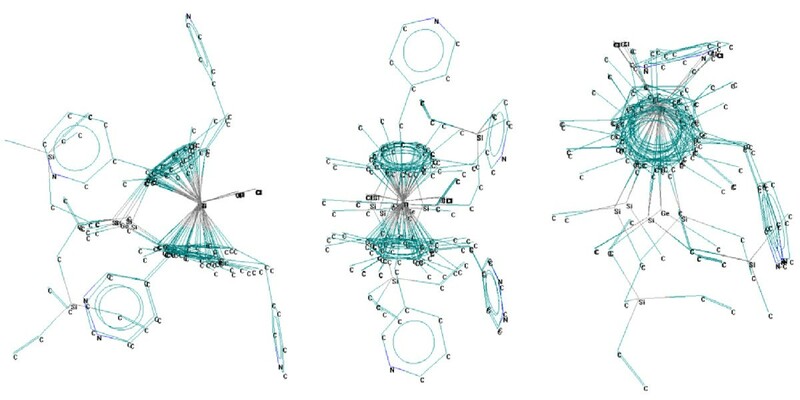 The HyperChem 5.11 package was used for building and molecular modelling of titanocene and cyclodextrin structures, as well as for titanocene/cyclodextrin complex optimization. 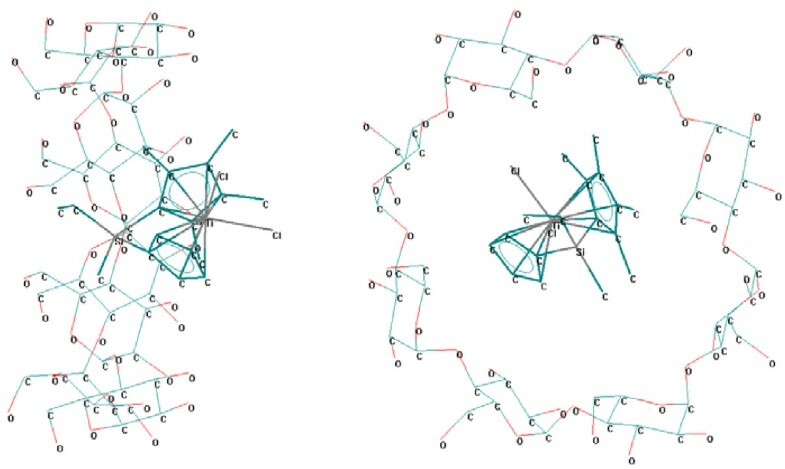 For titanocene/cyclodextrin complex optimization experiments, the titanocene and cyclodextrin structures in minimal energy conformations were set up at various distances and positions between molecules (molecular mechanics functionality, MM+). The best interaction between titanocene structures and cyclodextrins was obtained in the case of β- and γ-cyclodextrin, having the hydrophobic moieties oriented to the secondary face of cyclodextrin. The hydrophobicity of titanocenes (logP) correlate with the titanocene-cyclodextrin interaction parameters, especially with the titanocene-cyclodextrin interaction energy; the compatible geometry and the interaction energy denote that the titanocene/β- and γ-cyclodextrin complex can be achieved. Valuable quantitative structure-activity relationships (QSARs) were also obtained in the titanocene class by using the same logP as the main parameter for the in vitro cytotoxic activity against HeLa, K562, and Fem-x cell lines. According to our theoretical study, the titanocene/cyclodextrin inclusion compounds can be obtained (high interaction energy; the encapsulation is energetically favourable). Further, the most hydrophobic compounds are better encapsulated in β- and γ-cyclodextrin molecules and are more stable (from energetically point of view) in comparison with α-cyclodextrin case. This study suggests that the titanocene / β- and γ-cyclodextrin complexes (or synthetically modified cyclodextrins with higher water solubility) could be experimentally synthesized and could have enhanced cytotoxic activity and even lower toxicity. Cancer is a generic name comprises a great number of medical affections, having various locations and symptoms [1–5]. Even this disease is studied more than fifty years, the cause and action mechanisms are not completely elucidated [3, 6, 7]. Chemotherapy is widely used in order to cure this disease, by using various cytostatic or cytotoxic compounds: alkylating agents, antimetabolites, hormones, immunostimulating agents, antibiotics, alkaloids, all of them with higher toxicity [1, 8]. Organometallic compounds is an important class used in chemotherapy and the main groups studied are metallocenes (compounds which contains two cyclopentadienyl anions bound to a metal centre in the oxidation state II), ruthenium-, osmium-, iridium half-sandwich complexes, rhenium organometallics, metal N-heterocyclic carbene complexes, metal carbonyl complexes, or miscellaneous organometallic compounds . The actual trend in cancer treatment is to replace some of the more toxic drugs such as cisplatin with less toxic compounds. Organometallic compounds are widely studied from cytotoxic point of view. Ferrocene was one of the first organometallic compounds from the first group evaluated for its antiproliferative properties [9, 10]. Ferrocene derivatives were obtained as antimalarial or cytostatic drugs and drug candidates . Recently, similar metallocenes were synthesized and analyzed by biological activity point of view: ruthenocenes, cobaltoceniums, titanocenes, zirconocenes, vanadocenes, niobocenes, molibdocenes etc. [9–23]. The titanocene compounds are promising such drugs, but the hydrolytic instability and slightly water solubility conduct to a lower cytotoxic activity (approximately ten fold lower than cisplatin). Further, in the titanocene series cytotoxic activity against HeLa, K562, and Fem-x cell lines increases with the overall hydrophobicity of compounds [16, 17, 22]. On the other hand, increasing the hydrophobicity of titanocenes conducts to a more lower water solubility and reducing the transport capacity in aqueous layers (even the transport capacity through lipid layers are increased) [16, 17]. Despite of the resemblance of titanocene dichloride derivatives with cisplatin, seems that the mode of action as anti-cancerigene is different: binding to DNA and apoptosis of the cancer cell for the cisplatin and binding to DNA phosphate group, with additional interaction stabilizing the binding to DNA, for titanocenes. Two main problems of the titanocene dihalides are the poor hydrosolubility and the hydrolytic instability . These problems could be resolved in two ways: synthetically modifying the titanocene structure (laborious, other physico-chemical and biological analyses needed) or finding new formulations with enhanced properties [11, 13, 15, 19, 24–27]. Natural or chemically modified cyclodextrins (cyclic oligosaccharides with hydrophobic inner cavities and hydrosolubilizing outer groups) are widely used for protection, enhancing water solubility, and controlled release properties of bioactive compounds [28–34]. The aqueous solubility of metallocenes (i.e. titanocenes) with cytostatic or cytotoxic activities could be enhanced by molecular encapsulation in cyclodextrins, as well as the hydrolytic instability of these compounds could be reduced (by reducing the access of water molecules to the metallocene halide reaction centre) [13, 19, 25, 27]. This study presents a theoretical approach on the molecular encapsulation of a series of titanocenes with cytostatic activity in α-, β-, and γ-cyclodextrin, in order to obtain supramolecular systems with enhanced stability and bioavailability. Further, a quantitative structure-biological activity relationships (QSAR) studies were performed in order to evaluate the main parameters which influencing the in vitro cytostatic activity. Molecular modelling and conformational analysis of titanocenes were performed by using the default parameters of MM+ functionality from the HyperChem 5.11 package . This method is appropriate especially for organic molecules, but in our organometallic series the “inner” metal did not have a major influence on the overall geometry of compounds. Titanocenes with cytotoxic activity indicate a reduced number of stable conformations, especially for structures with a lower flexible bonds (codes 01TC, 02TC, 08TC to 10TC); structures having dimethyl-vinyl-silyl-ethyl or trivinyl-silyl-ethyl moieties at the Si, or pyridinium-methyl moieties at the cyclopentadienyl rings have a higher number of stable conformers; the most stable conformations are partially superimposed, especially at the titanocene skeleton. The most stable conformations have all flexible substituents (Y, R, and R’ from the general structure, Table 1 and Scheme 1) oriented close to a pseudoplan formed by Ti and the gravity centres of the two cyclopentadiene rings (Figure 1) [see Additional file 1. (a) cytotoxic activity was expressed as the logarithm of the inverse inhibitory concentration 50%, pIC 50 = log(1/IC 50 ); pA 1 , pA 2 , pA 3 were used for in vitro cytotoxic activity against HeLa, K562, and Fem-x cell lines, respectively. General structure of titanocene compounds. Superimposed minimum energy conformations of titanocene structures (OX, OY, and OZ view). In order to evaluate the importance of titanocene structure/conformation to the overall cytotoxic activity, the most important steric, electronic, and hydrophobic descriptors were evaluated by using QSAR Properties functionality. Molecular van der Waals surface and volume, refractivity, and polarizability for titanocenes in minimum energy conformations were evaluated from sterical descriptor class (Table 2), but some intercorrelation exists, especially in the case of S vdW – V vdW and Rf – Pol pairs (intercorrelation coefficient of 0.87 and 1.0, respectively, Table 3). This intercorrelation is poor for S vdW /V vdW and Rf/Pol. Hydration energy has no correlation with descriptors from the other classes, but the transport parameter, logP, correlates with Rf and Pol parameters with higher intercorrelation coefficients (inverse correlation of −0.85 and −0.87, respectively, Table 3). (a) van der Waals molecular surface (S vdW , Å2), van der Waals molecular volume (V vdW , Å3), hydration energy (E hydr , kcal/mole), logarithm of the octanol/water partition coefficient (logP), refractivity (Rf, Å3), and polarizability (Pol, Å3). Taking into account these intercorrelations, only logP, Rf, and Pol reveals statistically significant quantitative structure – cytotoxic activity relationships (QSARs) [36, 37], which could drive molecular changes in this titanocene class in order to obtain new compounds with higher biological activity. In the case of HeLa cell line, in vitro cytotoxic activity of titanocenes correlates with the logP parameter (Eq. 1), having a correlation coefficient of 0.80, which is higher than in the other cases; the correlation coefficient for the case of K562 is little bit lower (Eq. 2), but statistically significant, as well as in the case of Fem-x cell line (Eq. 3). A significant correlation was also obtained if the polarizability, Pol, was used as independent parameter (Eq. 4); for example, an inverse correlation exists between cytotoxic activity against K562 cells (expressed as pIC 50 ) and polarizability (r = 0.80), but this parameter is intercorrelated with the hydrophobic one. As a result, if the polarizability is lower, the hydrophobicity is increased and the transport, the interaction of titanocene with the hydrophobic cell membrane is favoured, and further the cytotoxic activity is increased. The predictive accuracy was evaluated by cross-validation method (leave-half-out method), all models having cross-validation correlation coefficients q 2 cv > 0.75 [see Additional file 1. The predicted pA activities, calculated with equations Eq. 1 to Eq. 4, as well as the differences between experimental and predicted activities, are presented in Table 4 [see Additional file 1. (a) Compounds No 1–3 are selected from reference , compounds No 4–8 from , and compounds No 9–11 from . (b)A (IC 50 , μM) – the in vitro cytotoxic activity (±SD) of titanocenes selected from references [16, 17, 22]; pA – the logarithm of the inverse inhibitory concentration 50%, pIC 50 = log(1/IC 50 ); pA pred. – the predicted cytotoxic activity (as the logarithm of the predicted inverse inhibitory concentration 50%, pA pred. = pIC 50, pred. = log(1/IC 50,pred. ); ΔpA – the difference between experimental and predicted activities (as the logarithm of the inverse inhibitory concentration 50%), ΔpA = pA – pA pred. QSAR results (Table 4 and Eqs. 1–4) indicate very good predictions of cytotoxic activity against HeLa and Fem-x cell lines, especially in the case of compounds 01TC-11TC (|ΔpA| < 0.11, except compound 09TC for HeLa cytotoxic activity; this compound contains Ge as the second metal atom, in comparison with the other titanocene compounds, which contain only Si instead). Higher differences were observed in the case of pyridinium-methyl derivatives which have no Si as the second metal atom; the presence of Si atom in the structure stabilizes the overall titanocene structure (compounds 23TC, 24TC, and 26TC). Good results were obtained for prediction of the cytotoxic activity against K562 cell lines for models obtained with logP and Rf as structural parameters (Eqs. 2 and 4). The difference between experimental and predicted activity was lower than 0.2 in almost all titanocene cases (except compound 18TC, having trivinyl-silyl moiety and the highest Rf value) (Table 4). However, a correlation between predicted activities against K562 cell lines obtained with Eqs. 2 and 4 exists (r = 0.67); this result is sustained by the logP – Rf intercorrelation coefficient which are involved in Eqs. 2 and 4 (Table 3). It is known that the cytotoxic activity of titanocene dichloride is different from cisplatin action (the last being more toxic, but with higher cytotoxic activity): titanocenes conduct to adduct with DNA and prevent the replication and/or transcription, resulting in cell death . Thus, the transport of titanocene to the DNA is very important, but the lower water solubility and instability (hydrolysis of chloride ligands) reduces the access to the target - biomacromolecules; on the other hand, if the hydrophobicity is increased (the QSAR study indicates a higher in vitro biological activity for more hydrophobic titanocenes), the titanocene transfer in aqueous layer is decreased (especially in the case of the in vivo experiments). Thus, the increase of the hydrophobicity in order to enhance the in vitro cytotoxic activity conducts to a less water solubility and a harder transport of the titanocenes to the target. The water solubility of hydrophobic molecules could be realized by molecular encapsulation in matrices such as cyclodextrins. Among the increasing of water solubility, the advantage of this procedure is to protect of easier hydrolysable titanocenes against degradation and controlled release to the target (i.e. DNA); further, the higher hydrophobicity of modified titanocenes conduct to a better interaction with the hydrophobic inner cavity of cyclodextrins. Fully geometry optimization of titanocene / cyclodextrin supramolecular systems or docking of organometallic compounds in cyclodextrins [38, 39] could provide information on the stability of complexes and suggest chemical modifications for new titanocenes with higher cytotoxic activity. In our theoretical experiments of fully geometry optimization of titanocene / cyclodextrin supramolecular systems in vacuum (the default HyperChem molecular mechanics MM+ force field was used), only the interaction of the hydrophobic moiety of titanocene with the inner cavity of cyclodextrins from the secondary face was efficient (higher stability of the complex). The main interactions which stabilize the titanocene / cyclodextrin complex in vacuum were bond stretching energy, the angle bending energy, the torsional energy, and the energy arising from van der Waals interactions of non-bonded pairs of atoms. Due to the fact that all titanocene compounds from the studied series are chemically similar molecules, we have an internal consistency from the force field point of view [15, 40–49]. In the case of α-cyclodextrin, the interaction of titanocenes with the secondary face is poor, even with structures having thin hydrophobic chains (e.g. 03TC, 18TC, 23TC, 24TC, and 26TC; Figure 2) [see Additional file 1]; the worst interaction was observed for the case of titanocene oriented to the primary face of α-cyclodextrin or with the titanocene moiety in the front of both cyclodextrin rings. Theoretical interaction energy between titanocenes and α-cyclodextrin was in the range of 11.9 kcal/mole to 19.7 kcal/mole (Table 5). The best interactions of titanocenes with α-cyclodextrin were obtained in the case of structures having compounds monosubstituted at the Si (02TC and 10TC, E int. 19.7 kcal/mole and 17.0 kcal/mole, respectively) or having flexible chain connected to this atom (03TC and 18TC, E int. 18.0 kcal/mole and 17.0 kcal/mole, respectively). Lower interaction energies between titanocenes and α-cyclodextrin were obtained for compounds di-substituted at the Si atom with short chain moieties (methyl or vinyl) and for those substituted at the cyclopentadienyl rings with pyridinium-methyl moieties (Table 5). These low interaction energies are especially due to the geometric compatibilities, which are close to the limits and the interactions with the hydrophobic inner cavity of α-cyclodextrin are reduced. This is the reason that the hydrophobicity (expressed as logP) is not important (r < 0.5) in relation with the titanocene / α-cyclodextrin interaction energy, while the hydration energy (E hydr. ) weak correlates with this interaction energy (Eq. 5). Titanocene (code 03TC) / α-cyclodextrin supramolecular system (theoretically modeled by MM+). The superior homologues, β- and γ-cyclodextrins, are more proper for molecular encapsulation of the studied titanocenes (Figures 3 and 4). In all β- and γ-cyclodextrin complexes the mono- or disubstituted silyl moiety, the bulky moiety (dimethyl-vinyl-silyl or trivinyl-silyl substituents) from the edge of the corresponding substituent, or the pyridinium-methyl substituent from the cyclopentadienyl ring are almost completely encapsulated in the cyclodextrin cavities [see Additional file 1]. In these cases the hydrophobicity of titanocenes (quantified by the logarithm of the 1-octanol/water partition coefficient) was important for the molecular encapsulation process and the interaction energy correlates with logP in a statistically significant way (Eq. 6 and Eq. 7). Thus, better interactions were obtained with the titanocenes having pyridinium-methyl substituents on the cyclopentadienyl rings (codes 24TC and 26TC), the interaction energy being 23.7-24.3 kcal/mole and 27.3-28.1 kcal/mole for β- and γ-cyclodextrin, respectively (Table 5). Higher interaction energies were obtained also for titanocenes having monosubstituted silyl moieties, 02TC and 10TC, especially in the case of γ-cyclodextrin complexes (28.4 kcal/mole and 28.6 kcal/mole, respectively; Table 5). Furthermore, a statistically significant correlation between titanocene / β- and γ-cyclodextrin interaction energies was observed (r = 0.82) [see Additional file 1]. Titanocene (code 23TC) / β-cyclodextrin supramolecular system (theoretically modeled by MM+). Titanocene (code 01TC) / γ-cyclodextrin supramolecular system (theoretically modeled by MM+). The stability of the titanocene / cyclodextrin supramolecular system is observed from Figure 5 for β- and γ-cyclodextrin cases: the better stability is obtained in the case of γ-cyclodextrin, followed by β-cyclodextrin case, and finally for α-cyclodextrin complex after more than double number of iterations. This variation of the energy interaction reveals the possibility of forming the titanocene/cyclodextrin complexes and the stability of these supramolecular systems [see Additional files 1 and 2]. Interaction energy vs . 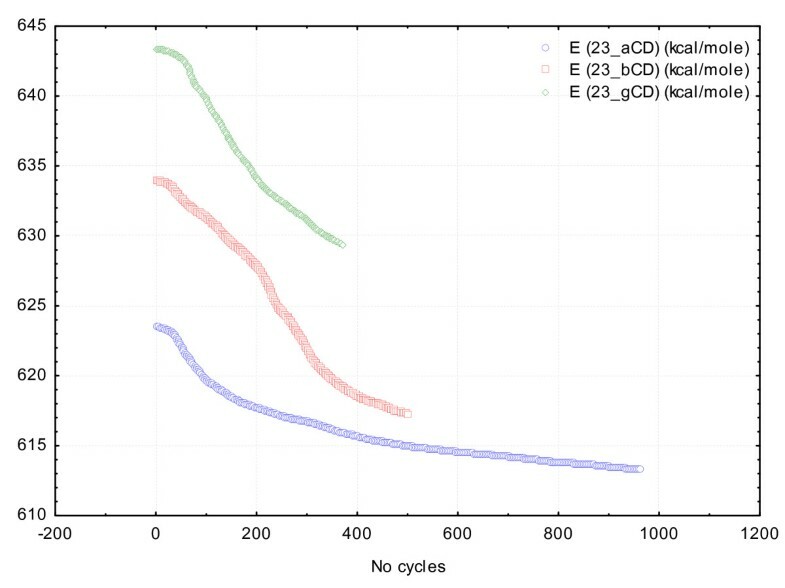 Number of cycles from MM+ titanocene/cyclodextrin geometry optimization experiments for 23TC. In our study the importance of the hydrophobic parameter (logP – the logarithm of the octanol/water partition coefficient) in both of in vitro cytotoxic activity against HeLa, K562, and Fem-x cell lines, as well as in the cyclodextrin nanoencapsulation of the titanocene compounds were demonstrated. Our theoretical studies demonstrates that the molecular encapsulation of titanocenes in natural cyclodextrins could resolves some of cytotoxic titanocene disadvantages: a more hydrophobic titanocene, which have higher cytotoxic activity (the in vitro cytotoxic activity against HeLa, K562, and Fem-x cell lines is increased with the logP of the titanocene compound; r > 0.7), is better encapsulated in cyclodextrins and could be transported through the aqueous layers (cyclodextrin inclusion compounds are water soluble) and protected against hydrolysis. Our theoretical study on the titanocene / cyclodextrin complexes indicate that the hydrophobic biologically active compounds (with higher cytotoxic activity) are better encapsulated in β- and γ-cyclodextrin; the highest titanocene / β- and γ-cyclodextrin complex interaction energies of ~24 kcal/mole and ~28 kcal/mole was obtained in vacuum for bis(pyridinium-methyl)-silyl derivatives, respectively. This study indicate that the titanocene compound can be controlled released to the target from the cyclodextrin complex; this complex allow to transfer the more hydrophobic titanocene through lipid layers, to increase the concentration of bioactive compound to the DNA phosphoester groups and further to form the titanocene-DNA adducts. Due to this process the inhibition of DNA transcription and/or replication appears (cytotoxicity). According to our theoretical study, these titanocene/cyclodextrin inclusion compounds can be obtained (the encapsulation process is energetically favourable for β- and γ-cyclodextrin complexes). Further, the most hydrophobic compounds are better encapsulated in β- and γ-cyclodextrin molecules and are more stable (from energetically point of view) in comparison with α-cyclodextrin case. This study suggests that the titanocene/β- and γ-cyclodextrin complexes (or synthetically modified cyclodextrins with higher water solubility) could be experimentally synthesized and could have enhanced cytotoxic activity and even lower toxicity. Titanocenes with potential anticarcinogenic properties were recently synthesized by Gómez-Ruiz et al. [16, 17] and Potter et al. and have structural variability at the cyclopentadienyl moieties. All these new titanocene structures (eleven organometallic compounds) with cytotoxic activity against cervical carcinoma cell line HeLa, human myelogenous leukemia cell line K562, and human malignant carcinoma cell line Fem-x were considered in this theoretical study. Cytotoxic activity was expressed as the logarithm of the inverse inhibitory concentration 50%, pIC 50 = log(1/IC 50 ); pA 1 , pA 2 , pA 3 were used for cytotoxic activity against HeLa, K562, and Fem-x, respectively (Table 1). Molecular modelling of titanocene molecules as well as α-, β-, and γ-cyclodextrins was performed by using the molecular mechanics MM+ functionality from the HyperChem 5.11. The MM+ molecular mechanics force field with a RMS of 0.005 kcal/mole, a number of maximum cycles to limit the search directions of fifteen times the number of atoms, and a Polak-Ribiere algorithm (a gradient method using one-dimensional searches) were used in the molecular modelling process. Bond dipole was used to calculate all nonbonded electrostatic interactions. In the MM+ calculations potential energy depends on bond lengths, bond angles, torsion angles, and nonbonded interactions (van der Waals forces, electrostatic interactions, and hydrogen bonds) [50, 51]. In order to find the most stable conformation even for titanocenes or cyclodextrins, a conformational analysis by using Conformational Search functionality (HyperChem 5.11) was performed. In titanocene structures only some side chains have flexible bonds. On the other hand, the flexible bonds in cyclodextrins were only those corresponding to the hydroxymethyl from C5 position of glucopyranose unit; the flexible rings were all glucopyranose rings and the corresponding macrocyclic ring. The following conditions were set up for conformational search: variation of the flexible torsion angles ±60º Ã· ±180º, energy criterion for acceptance of the conformation 4 kcal/mole above minimum, all conformations with atomic distances lower than 0.5 Å, and differences between torsion angles lower than 15º were not considered as well as conformations with energy differences lower than 0.05 kcal/mole (duplicates); the maximum number of optimization and iterative calculations was 1000 and maximum 20 conformations were retained. The hydrogen atoms were neglected. The geometry optimization of titanocene (the most stable conformations) / cyclodextrin (α-, β-, and γ-cyclodextrin) complexes was realized by using the molecular mechanics interactions of the host-guest molecules in vacuum. The titanocene and cyclodextrin structures in minimal energy conformations were set up at distances of ~8Å between the gravity centres of the host-guest molecules, and the titanocene structure was oriented with the hydrophobic side chain in front of the primary (A) or secondary (B) face of cyclodextrin (the principal axis corresponding to the biocompound or side chain moiety was perpendicular to the A or B plan of cyclodextrin). The complex was modeled in absence of water molecules by using the same MM+ functionality and the interaction was stopped when the RMS gradient was lower than 0.005 kcal/mole. The titanocene-cyclodextrin interaction energy was evaluated as the difference between the overall energies of these two molecules and the energy of the complex. The main molecular descriptors of titanocenes were evaluated by using QSAR Properties functionality from the HyperChem 5.11 package. The following descriptors were calculated and were used as structural parameters for obtaining correlations with titanocene-cyclodextrin interaction energy or quantitative structure-activity relationships (QSARs): van der Waals molecular surface (S vdW , Å2; van der Waals surface area was carried out by an approximate developed by Still and co-workers [52, 53]), van der Waals molecular volume (V vdW , Å3; the grid method described by Bodor et al. was used for van der Waals volume calculation. The QSAR Properties functionality uses the atomic radii of Gavezotti  for this method), hydration energy (E hydr , kcal/mole; the method of calculation is developed by Ooi et al. . The calculation is based on exposed surface area, and employs the surface area as computed by the approximate method, weighted by atom type), logarithm of the octanol/water partition coefficient (logP; it was calculated by means of atomic contributions [57, 58]. Metal atoms were excepted from calculation; this approximation did not significantly affect the final results due to the “hidden” positions of these metal atoms), refractivity (Rf, Å3; the refractivity is estimated by the same method as logP, presented by Ghose and Crippen ), and polarizability (Pol, Å3; this parameter was estimated according to an additive method of Miller , where the different increments are associated with different atom types). Monolinear correlations (Eqs. 8a and 8b) in theoretical titanocene-cyclodextrin interaction experiments and QSARs were evaluated by using interaction energy between titanocene and cyclodextrin molecules (E int. ) or the above mentioned pA cytotoxic activity and structural parameters (P). This work was supported by Ministry of Education, Research, Youth, and Sports from Romania, PN2_ID_PCCE_140/2008. Authors are grateful to Professor Mircea Mracec (“Coriolan Drăgulescu” Institute of Chemistry, Timişoara, Romania) for permission to use the HyperChem 5.11 molecular modeling package. NGH and DIH carried out all theoretical experiments and prepared the final manuscript. AR and ZG help to discuss the theoretical results. All authors read and approved the final manuscript.